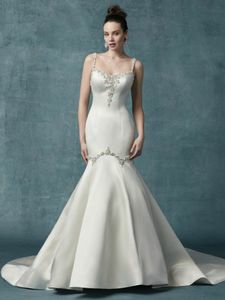 Description: Exquisite beading and Swarovski crystals trim the trumpet skirt and bodice of this Carlo satin wedding dress, completing the illusion scoop neckline and spaghetti straps. Finished with zipper and inner elastic closure, with covered buttons trailing from back to hem. Detachable cold-shoulder straps accented in beads and Swarovski crystals sold separately. Also available in Blush Elegance satin, 9MC017MC.